When Tom Coughlin became the Giants’ head coach and began hiring assistant coaches in January 2004, he retained only one position coach from the previous staff: tight ends coach Michael Pope. Coughlin’s reasoning was simple and logical. “He is the best tight ends coach in football,” Coughlin said. Pope has proven that for many years. This is Pope’s 24th consecutive season as an NFL coach. He is one of the league’s most experienced, respected and successful assistant coaches. Pope has coached in 23 postseason games and is one of the few assistants to make four trips to the Super Bowl, having also gone with the New England Patriots in 1996. He is in his seventh season of his second tour of duty as a Giants assistant coach. In his two stints with the Giants, Pope has been with them for all three of their Super Bowl appearances. Click here to open a new page and read the rest of this story. Mike Pope (MHS 1960) is # 56 in the picture posted below ( see MHS FOOTBALL! Posted January 1). I love seeing what people have gone on to accomplish in their lives. Seems Mike is one of those who is living his dream doing what he loves. That is so special! (Thanks Margaret - yo special too!) I'm gonna write Roger a reminder to push aside all his "busy-ness" and read/comment. He will love it!! 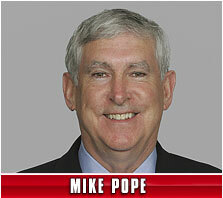 Seeing Mike Pope's pic was sort of strange. Jim and I were just watching the Giant's game on TV yesterday and wondering if Mike was still with the team. He must be up in the booth as we never see him on the sidelines. He went to Ole Miss the year after we left so our paths have not crossed, but Jim has always thought so highly of Mike and would love to see him. If anyone has his address, let me know, as Jim would like to drop him a line and catch up.